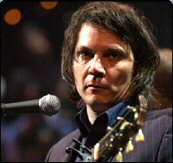 Jeff Tweedy, Wilco's frontman, is out on the road on a solo tour. Does this mean the end of Wilco? An interview with Tweedy gives Wilco fans reason to rest easy that more Wilco will be forthcoming. "This way, I can do any of the 200 or so songs I've written over the years. And it allows me to change it around every night, which is also part of the appeal - it'll be fun to just get up there without a firm set list. I never really thought of Wilco an 'alt-country band.' 've always just thought of Wilco's songs as folk songs. We've just like doing things in the studio, with different production touches, that we can't do on stage. To be honest, I really don't even like that word. I liked Tom Waits' quote on that topic. He said, 'An alternative to what, silence?" More on Wilco's music and influences..
wish i could have caught Tweedy on the 11/5 show... if only he'd come further south! I caught Tweedy solo at the Calgary Folk Fest this past summer. He put on a pretty sweet show, for sure. Helped that I knew the "Yankee Hotel Foxtrot" material, but I've never heard any of his or Wilco's other stuff and I enjoyed it.